Over the last four days (since my article on the Russian storm on Vuhlehirs’k), the situation around the current battle focus town of Vuhlehirs’k was hazy to say the least with Russian forces claiming, they controlled all of it and advanced further to the north and north east while the Ukrainian army said, they dealt devastating blows to the “terrorists and Russian Federation troops” in the area. Just today, the Ukrainian army’s spokesperson Lysenko talked of a “mass death” of militants, after they “came out of the settlement” as they were “covered” with artillery and missiles – inside. However, he also said, the surviving troops were “chased” back in by their commanders to hold it. Meanwhile, what he did not say (during the last 4 daily pressers) was whether Ukrainian troops managed to re-occupy certain or all areas of the town or if all “Ukrainian counterattack” is just a matter of extreme artillery and MLRS fire from outside. Such extremely contrary statements by both sides involved made it very difficult to assess the situation from a fact-based perspective, not relying on claims, but veritable pictures from the ground. These pictures were not available since January 30 from neither side, making an objective evaluation of the situation virtually impossible. This changed today. In the early morning of February 3, 2015, Russian media claimed, there was a “humanitarian ceasefire” in Vuhlehirs’k between the two involved parties, giving hundreds of civilians the opportunity to flee “to the safety of the DNR and Makeevka”. The Russian narrative was that all civilians in the town were “terrorized” by the Ukrainian shelling and willing to flee to Russian-held areas. Shortly after these statements, first footage appeared of what indeed seemed to be civilians lining up at the (geolocated) western railroad crossing of Vuhlehirs’k and being transported into Russian-held territory by trucks and busses. Shortly after another Russian news station reported with footage from the same area. There are two possible conclusions to be drawn from the footage concerning the situation in and around the city. It seems generally unlikely that Ukrainian civilians would cross the frontline to get evacuated – even in case of a local ceasefire for several hours. Hence, it is more likely that civilians are willing to get evacuated by the respective side controlling the territory they live in. Therefore one conclusion would be that the Russian side indeed controls much of the town as several hundred civilians via their exit points of it. Not because they would be anymore aligned to their side, but simply because it is the safest way to leave the death zone. This would support the Russian narrative of wide control over the area. At a second glance, something seems odd about the footage and queuing people especially as both Russian channels use exactly the same way to follow the line from its end to its start and the ready-to-go buses and Ural truck. 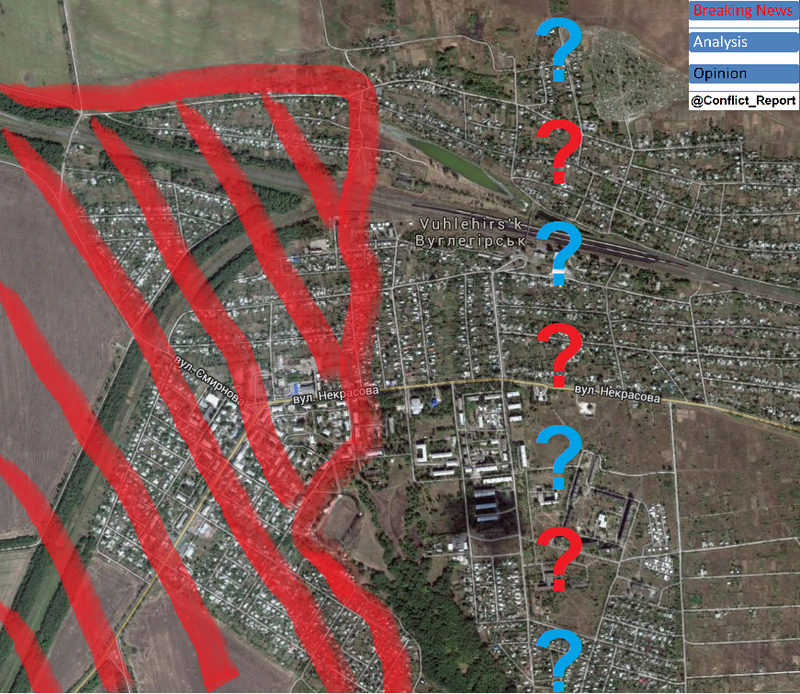 If these people really would come from the main inhabited areas of Vuhlehirsk, they would line up from the east or south east, where two larger streets lead into the city. Instead, they seem to have come from the north, a direction where almost no residential buildings are situated, but the frontline between Russian and Ukrainian positions, thus two reasons speaking against taking that way to seek safety. The below map visualizes this setting. This raises the question, if all of those refugees really come from the city and left it via the most dangerous way and from a direction where only few people live. Or if some of them were only moved their for the sake of some positive PR for the involved Russian army. Another possible reason is that such a “humanitarian gesture” could be a good pretext to regroup or hide own repositioning efforts in the area. In the footage, some 300-500 civilians can be seen lining up and several civilian busses as well as military truck are waiting to pick them up. This could mean that only a smaller part of the formerly 7000 inhabitants counting town is under control of the Russian army, however there is no conclusive evidence for that in the footage. In conclusion, the shown “evacuation” footage leaves some questions open while indeed showing, Russian forces control the western entrance of Vuhlehirs’k and there was no fighting before noon today. (parapgraph updated due to new footage and information) Also see Update at the end of the text. Beside the scenes from the far west of Vuhlehirs’k Russian media footage included more pictures, giving a deeper insight into the situation. There is one video, summarizing all that footage, which will be analyzed in the following paragraph. The first scene shows a T-64BV with its turret blown off by what must have been caused by a major impact. Another destroyed truck can be seen as well in the picture. The wreckages can be geolocated some 100 meters to the N-W of the main intersection of the town. Two more geolocated images show the central intersection, which was already the scene of fighting on January 29. From this footage, several conclusions can be drawn about who controls what in the town. At first, the Ukrainian claim that “all militants were killed and destroyed” in Vuhlheris’k can be falsified. Russian forces control at least the western and central part of the embattled city as the footage shows. Moreover, no military vehicles or defensive positions can be seen which means the actual frontline should be further to the east, leaving the center with the M04 behind the front and in Russian hands. However, it is also telling that Russian TV crews could not take any footage at the formerly held train station or the northern end of the town with its distinctive church (as shown several days ago). The below map shows what can be regarded as surely under Russian control in the city, taking into account the above stated reasons (e.g. safe to record by Russian TV, safe roads to get their plus the lack of real frontline positions). So what can be concluded from the available footage? 1. 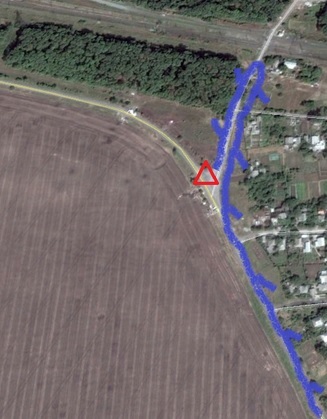 There is still no proof that Ukrainian forces control any territory in or around Vuhlehirs’k. Due to the lack of available footage, recorded by the Ukrainian army or embedded media branches, the claim that “heavy fighting is ongoing across the city” can not be verified, however also not totally falsified. 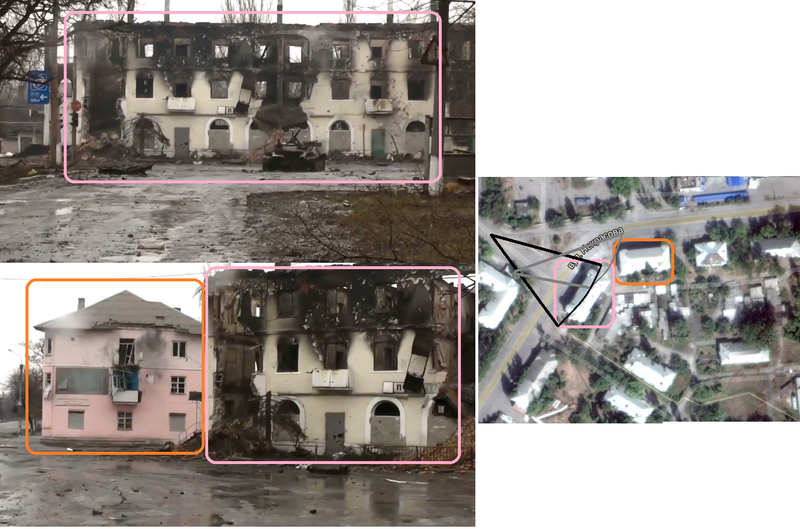 It is possible that Ukrainian units are still fighting inside the town, but such claim should be backed by at least one datable and geolocationable picture or video. 2. Russian forces hold major parts of the city. The analyzed footage shows that Russian forces still have a foothold in Vuhlehirs’k. Despite being hit hard by Ukrainian artillery and missiles, their presence in the west, center and thus surely also in the south can be verified. 3. It remains unclear, how much exactly the Russian army controls of the town. As stated above, the observed footage lacks the final proof, Russian forces control the entire regarded town, despite several indication is there, this might be the case. However, the situation at the real frontline seems to be regarded as too dangerous to film for Russian media or there are other reasons, why the Russian leadership is not willing to publish footage from the northern and eastern parts of Vuhlehirs’k. Last but not least, two more images from the latest footage should be considered. 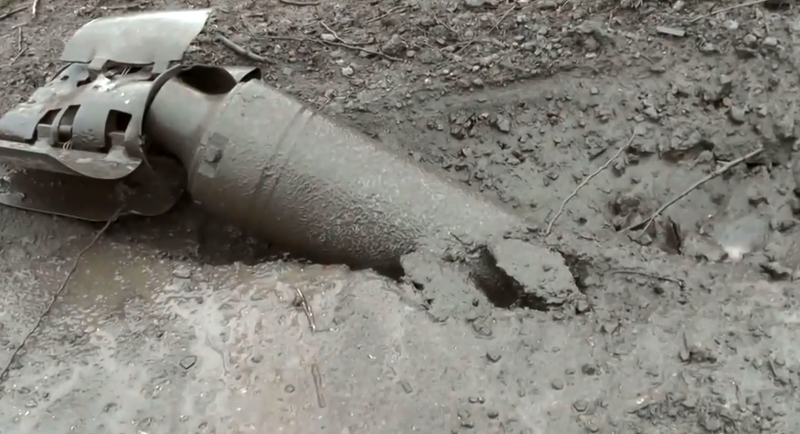 The first shows what appears to be a unexploded BM-27 missile, stuck in the mud, just beside the destroyed T-64. It is not unreasonable to infer that the Ukrainian army is shelling the Russian-held center (and possibly other parts) of the town Vuhlerhirs’k with 220 mm calibre missiles from the type “Uragan” despite the certain possibility that civilians may still be residing inside the town. Footage of such an attack could be seen in the January 29 footage and the fact that the Ukrainian army is “covering” the Russian invaders in the town is emphasized almost daily by the Ukrainian army command. The second picture is another piece of evidence that no one but the regular Russian army is leading the fight vs. Ukrainian forces across Donbas. 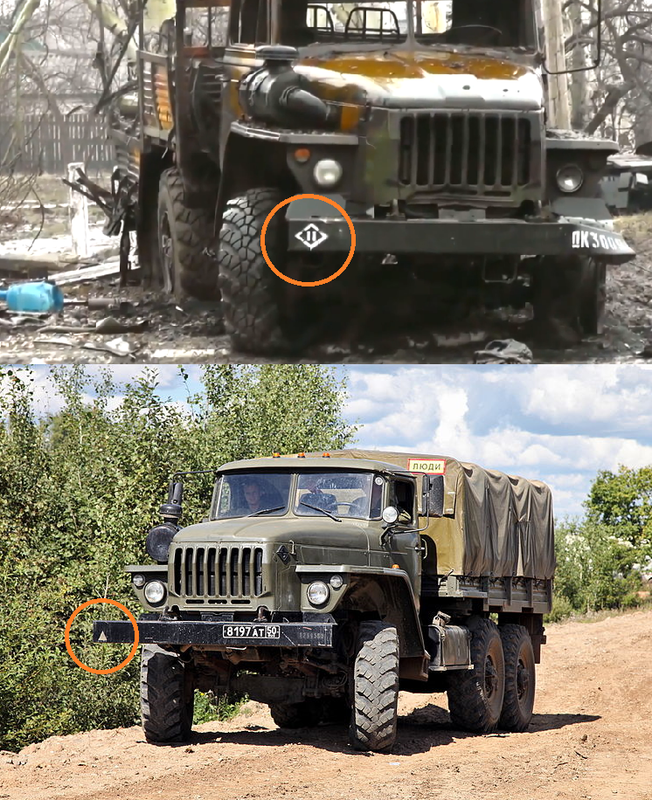 It shows the hit wreckage of a Russian army Ural-4320 truck, still bearing the typical unit identification mark at the vehicle’s bumper. This is another reminder to European media that no “separatists” are battling the Ukrainian army, but the armed forces of the Russian Federation. Also and especially at the battlefield of Vuhlehirs’k. Please support my work, producing independent and fact-based analysis on the situation in Ukraine with 1$ per month or more. Click here. 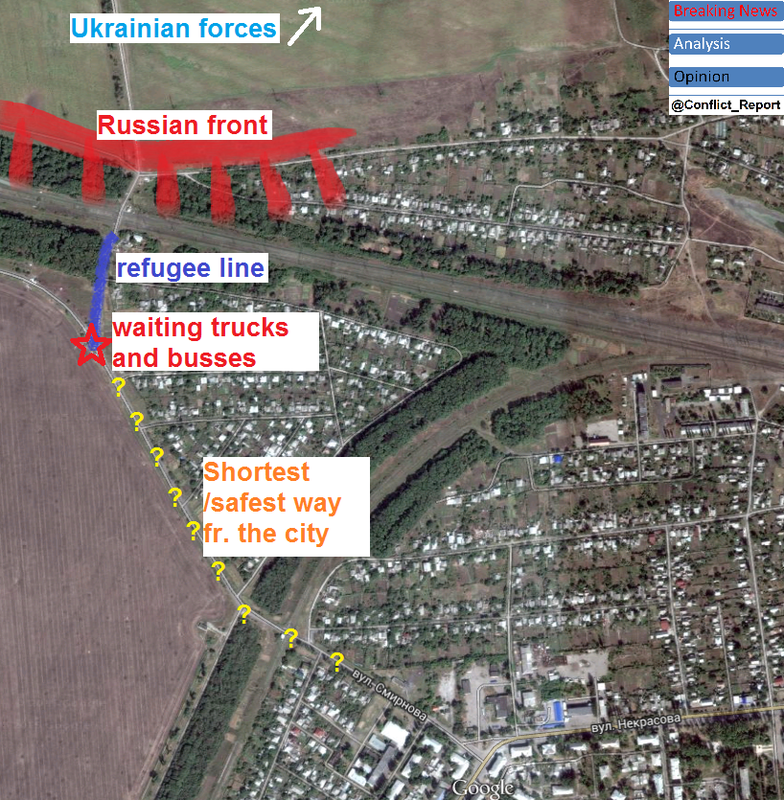 Pictures that appeared after this article was published indeed show, queuing civilians were likely asked to do so, facing the pick-up point from the north and the rail tracks. However it appears they originally came from the south east, so from the city itself. They were probably asked to take this “odd” 400 meter detour to keep the main road clear for other refugee cars and military vehicles passing by. This means that the chance, some of them were only “moved there” for any purpose is much less likely. – New facts bring new insights. That’s the way it is. This entry was posted in Ukraine and tagged Debaltseve, Invasion, Russia, Ukraine, Vuhlehirsk, War by Julian Röpcke. Bookmark the permalink. These pictures give a wider view of the situation and you could see people coming from the southern road either by foot or car. P.S.2: You are doing a greeeeeeeaaaaat job !!! 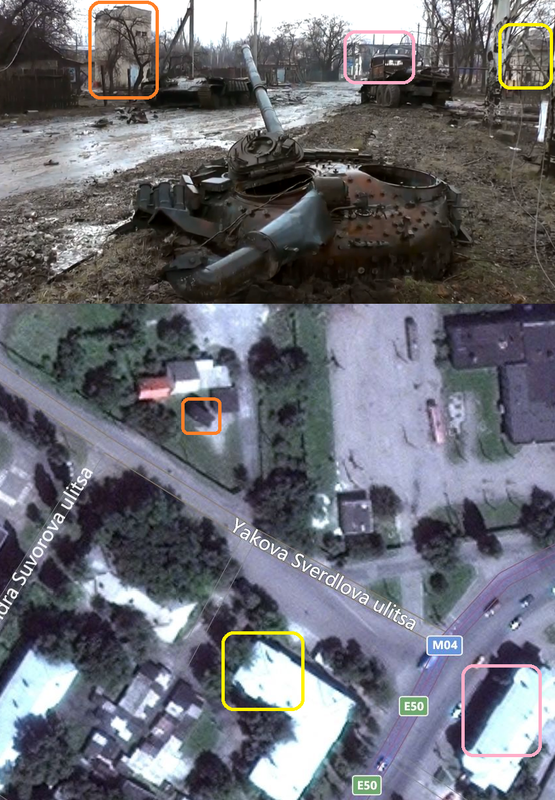 I changed it to T-64BV – but your drone pictures (thanks for them) prove nothing different. Please have a look to this : https://www.youtube.com/watch?v=ZLgMg3wPcBk the southern part of the city ( Nekasova Blvd gas station ) seems to be a combat zone. Not sure that russian control anything outside of the city in the south/south-east. I’m just writing an article on it. thanks! There is good resource about counting armour losses in this civil war. Some of the specialist from both Russia and Ukraine monitor it and leave comments to correct mistakes, so make identification much more simple. Only completely destroyed or captured armour with photo video proofs are added. Would be much less mistakes like that. I have an off topic question. I often see the LNR referred to as “LC”. What does “LC” stand for?